Oh babies are so cute aren't they? But when they chew your hair, expensive gold necklace or the shoulder pad of your soft leather jacket, then those little cherubs turn into little terrors! But seriously though, babies gums get ever so sore when they're teething and all we want to do as parents is take the pain away and help the poor little mites. When those baby teeth start coming through their mission is to chow down on the nearest object and this is why teething jewellery is such a life saver. A perfectly placed item that looks and feels good enough to eat. Yes! The perfect solution. East London Baby Company was launched in 2016 when owner, Katie couldn't find a teething necklace that distracted her daughter. So why not design her own, she thought? It was only when other mums starting asking her where they could get one, that the business was born. The necklaces combine different sized beads which allow the necklace to soothe all different sized, aged and shaped mouths. The large hexagon beads are great for the front of the mouth and the smaller beads are designed to reach the back. The silicone material used is the same as is used in traditional teething toys - flexible and springy to allow for a really great chew. The cord is made from super-strong nylon - although not designed to be chewed constantly, it's very strong and washable too. East London Baby Company also sell a range of bangles to compliment the necklaces. They have an interesting geometric shape, great for encouraging babies to put it into their mouths. 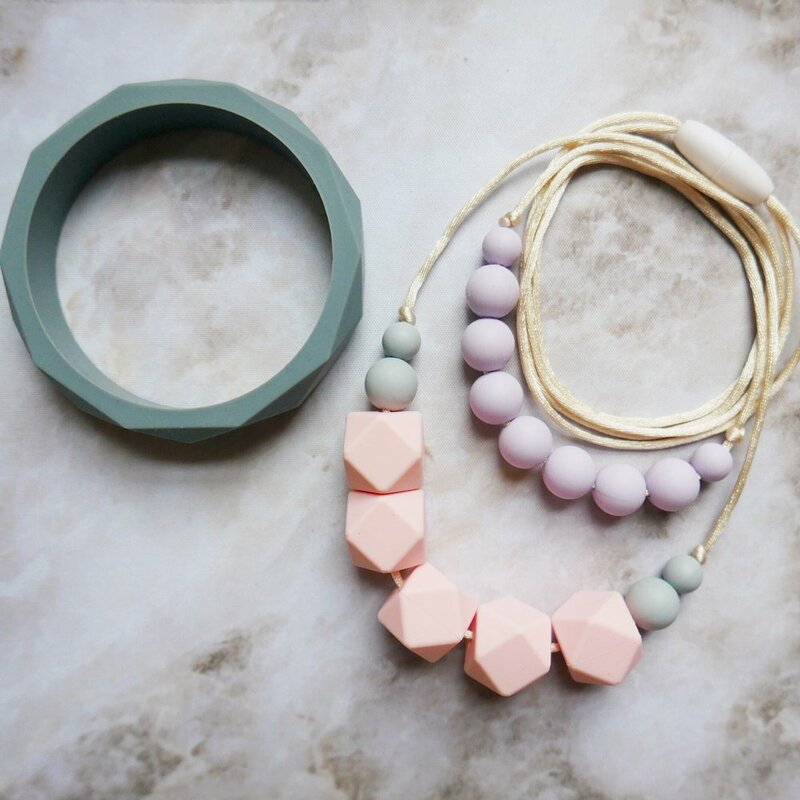 Made from the same silicone as the necklaces, the bangles are totally safe to be given to babies to chew as you would a teething toy. 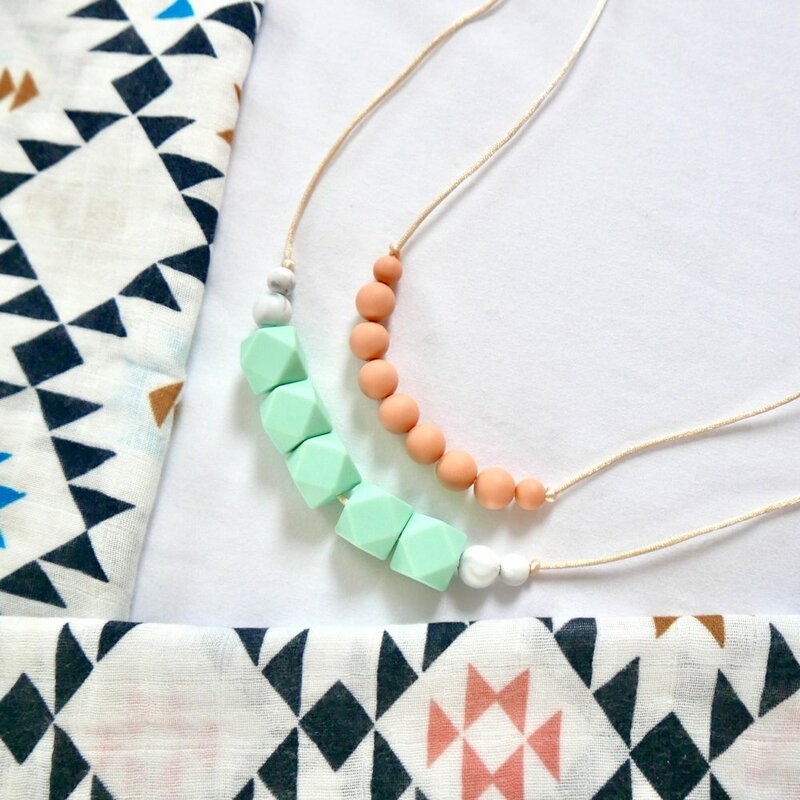 The colour-ways range from neutrals to brights and our favourite is the gorgeous Dalston necklace with it's cool marble effect combined with smaller mint green beads (see below), but we also love the 'Gunmetal' metallic, the red and black 'Fire' necklace and the pretty 'Lovebird' pink and lilac one too. ELBC necklaces combine style and function and their necklaces could be mistaken for a fashion item rather than a teething necklace! Have a look on their website for the full collection. Prices range from £7.95 for a bangle and from £14.95 for a necklace.